This was a juicy one. Our PE teacher Joe came to see me the other day to ask if I took requests for looking at research – Research Lead 101 says yes I do, so I did. Apparently PE Edutwitter has been talking about cooperative learning for teaching PE. He wanted to know if there’s anything specifically that supports cooperative learning for SEMH pupils. Certainly in regards to more academic subjects (the cooperative learning literature seems to use ‘mainstream classroom’ a lot but I’m adding SEND to the mix so don’t want to confuse things) direct instruction with occasional support from a bit of group work is something I’m happy with. In PE there’s obviously a lot of group work going on so it seemed like something that was worth a look at, particularly the opportunity to look at it from an SEMH/SEBD (the literature hasn’t caught up with SEMH yet) point of view. The other thing that intregued me was that a few times now (I’ve no references, just vague memories) I’ve heard sports instruction – direct instruction, drilling, practice of individual skills rather than whole-game – as examples for what we should be doing in other subjects. Here is PE looking at the alternatives to doing that. I thought it was a good opportunity to try out something I’d been mulling over and create a single-subject add-on to Relay. I’ve ended up creating ‘Relay FOCUS’ which in this instance looks at the research surrounding PE and SEBD/cooperative learning more broadly and then explores how they might work together. I’m not sure whether Joe was quite after what I’ve ended up with but I’m pleased with how it’s turned out and hopefully there’s more individual requests that I can work on. I know it’s not perfect and it won’t cover the whole topic nearly enough, but it’s not intended as a formal piece of literature research and hopefully it’s enough to help Joe decide whether he want to explore the approach or whether it’s something he wants to look into more. I’m annoyed by how long it’s taken me to write about researchED 2016 this year. After a weekend spent absorbing so many ideas and then hurtling back into the working week, I think it’s taken me longer to process. I want to write about it properly but I’m still buzzing from it all and can’t quite order my thoughts so apologies if it’s all over the place. This year looks like it’s going to be an interesting one for me researchED wise and this was a brilliant way to kick it off. The national conference is now firmly in the education calendar – with all the advantages of securing brilliant speakers and having a press presence. It’s also great to have the buzz of the run up and see so many people again (if not nearly for long enough in so many cases). The flip-side of this of course is that there is a core of familiar faces and we need to be careful not to become too cliquey; it’s easy to forget that not everyone knows what’s going on. I also had a couple of conversations where people seemed a bit disappointed with the session they went to and I think it’s really important to remember that at the heart of researchED is an ethos of everyone being able to share with each other. That means polished speakers that forgo their usual fee and it means nervous teachers quite prepared for 30 Year 9s but terrified of 15 adults. Not everyone will be polished but it’s amazing that everyone wants to share and connect. Paul Kirschner – Urban legends in education: What does the research say? I’m not going to go through each of them, but it’s worth highlighting a few bits from the day. The first session with Laura McInerney (when I found it) was probably the one that was most personal to me. Laura explored the relationship between perfectionism and performance anxiety in teachers and how that impacts on retention. Looking at the links between type of person who becomes a teacher alongside how people act when under pressure, Laura focused on seeking approval and worrying about mistakes – connecting to this idea of ‘teaching fright’. She suggested that one of the reasons other roles that require dealing with people or performing don’t have the same issues with staff retention is that they are not asked to ‘perform’ for so many people, for such a length of time and repeatedly. It certainly hit the nail on the head as to why I don’t want to teach (and probably why I like working in a small school). The important things to take from this are that we need to work out who is likely to suffer from this anxiety, when, and how we can prevent it. Whilst it’s not going to be the only reason people leave the profession, it might go some way to helping those who do. Understandably there was a noticeable undercurrent around the topic of grammar schools throughout the day and the session led by Becky Allen was all about this. I have never seen so many of the voices in education be so united against something as they are with the grammar schools proposal. Having spent so long pushing the message of evidence based/informed/led practice in education, for something that flies in the face of available evidence it’s understandable that people are cross (particularly as part of researchED). There are a lot of differences of opinion in education – probably magnified by Twitter, but the atmosphere was infectious. On a similar note, Tim Leunig’s session on ‘How ministers make decisions when evidence matters’ was fabulous. I could listen to him all day I think. Not saying I was agreeing with everything he said, but definitely one worth looking at the video of. All the available videos and presentations are on the researchED website. So now I need to use all this to get some stuff done. I’ve spent the past few rEDs with getting ideas for Relay in the back of my mind and wasn’t quite so worried about that this time. However there are a few bits I’ll write about and, for me, the evidence is clear that grammar schools are not the answer to our problems with education and the best way to stop this happening is to let people know. I’ve realised that surely one of the reasons for school to have me as Research Lead is that I can collate and translate all the information on this and encourage staff to respond to the consultation. I was going to do something in the next issue of Relay but I think there might be a bit too much information so I’ll see if I need to think of something else too. I’ve never written directly about researchED in Relay. Not sure whether that’s because I want to avoid bias towards my own interests or, as I remembered this week, it’s really tricky to talk about without sounding like you’re name-dropping! Mulling the idea of a ‘Research Special’ so who knows. I’ve not seen many blog posts about rEDYork and to be honest as I’ve not got anything down for a week I did wonder if it was worth it, but I quite often use these sorts of posts for my own reference so I’ll go for it. It’s been an unusually long time since I went to a researchED event – well, September, but that feels like a long time especially with the frequency of rED events popping up around the globe. It’s felt like a slightly slower year generally researchwise for me too I suppose, but this looks like it’s picking up with a few bits and bobs on the horizon. It was the sort of day I’ve become familiar with and was starting to miss. It was good to see some familiar faces and meet some new ones, with interesting conversations as standard. Not going to describe each and every moment but I’ll pick out some bits that have particularly stuck with me throughout this week. It was great to hear about how the RISE project is going down at Meols Cop Hight School. Realising that the job of leading things was too big for one person (and having responsibility for the school timetable), Leon Walker has passed on some of the responsibility to subject leaders and we heard what was being done in English, Maths and Science. The one that caught me here was Jen Filson talking about their Maths trial based on a research paper she was given. I did pinch this as an idea for Relay so if you’re interested you can read a summary here (pdf), but it was a brilliant example of taking an idea from research and using it to spark something, and having the opportunity to do so. My absolutely favourite thing from the day was slipped in at the end by Leon who revealed in the list of things they’re doing next year that in his timetabling duties has pre-set parallel groups into the structure of the school in order to make enquiry easier. Blowing my mind timetable style. It’s worth a bit of detail on Lisa Pettifer’s session. I almost didn’t go to it because I’d forgotten what I’d circled earlier and was getting swept away with the dining room crowd – glad I did go, she’s a guddun this one. Lisa talked about her role in the school’s Professional Development Department – how this sits in the school and how the school sits within their community. I loved how professional development is very much an interwoven part of school life and not an after thought (or a tick list of certifications we all need to do). I loved that there are no senior leaders in the PD team. I loved the range of opportunities they help provide. 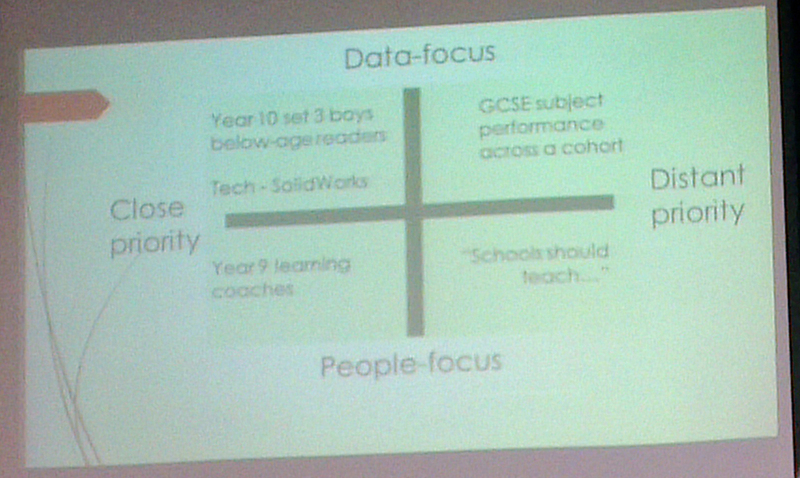 I loved the diagram of their PD model (I got to scribble it in my notes and I took a photo with my shoddy phone camera. Bonus points if you can make it out*). I really loved that they were taking the opportunity to bring PD in-school, achieving ‘success through collaboration’, and I would like to explore how we can get some of all this going at our school. Last one I’ll go into detail of is Carol Davenport on ‘unconscious bias’. This started with a breakdown of the reasons we have unconscious bias and how it can be useful (don’t misjudge a tiger for the wind) as well as problematic, before focussing more on the example of gender. I think working in a school where we only have boys, we are both more guilty of bias and more aware of it. I think for us, bias towards ‘boy stuff’ is often the easier option – football breaks, superhero themes etc. and there are reasons we generalise this stuff, the majority do like it. We do try though to move beyond it and consciously provide alternatives, whether that’s in exam courses like BTEC Hospitality alongside Motor Engineering or crafty options for lesson 6. Away from the ‘gender’ biases though I think we can be biased in other ways. Our boys come from very different backgrounds to most of our staff – culturally, economically, socially. We need to be careful not to pre-judge them and avoid self-fulfilling prophecies. This is something I’m particularly aware of as I baseline new pupils for next year. All our pupils have some sort of background that looks awful on paper and we can’t afford to focus on this too much. I’ve pretty much decided that the next issue of Relay will be a sort of research focussed issue. I’ve tried to avoid it being too ‘researchy’ and give a broader selection of things so far (I don’t really want to bias it towards myself probably), but I think there’s so much going on everywhere that it would be a good opportunity to give a round-up of a bit more. I’m proper excited for the National Conference in September now. Inspired by several people, especially Ffion Eaton, I decided to start a Learning and Development Bulletin at school. I went with using ‘learning’ and ‘development’ rather than including ‘teaching’ or ‘research’ because I wanted to make sure it was accessable to all members of staff. I’m concious that ‘teacher’ gets used as a blanket term but for those of us that aren’t one there’s always a bit of doubt as to whether we’re included. The name Relay was the result of a frustrating afternoon with a thesaurus. I settled on it as it’s symbolic of the main purpose for the bulletin, to share and pass on information between members of staff. 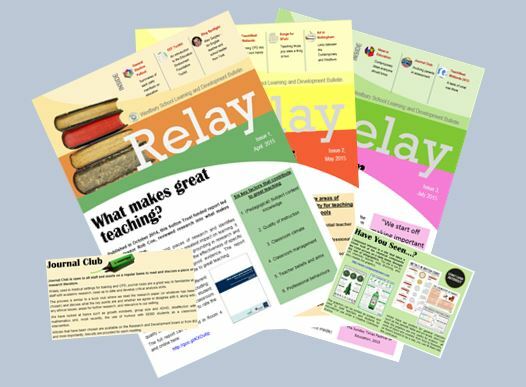 I want to encourage everyone to contribute to Relay – whether that’s writing an article or review, or simply prompting discussions in the staff room. I’m aiming for half-termly publication and so far I’ve managed this (with a bumper summer edition). At the moment it’s mostly stuff I’ve encountered at researchED or via Twitter but I’ve tried to go for a spread of topics and opinions, avoiding too much bias!